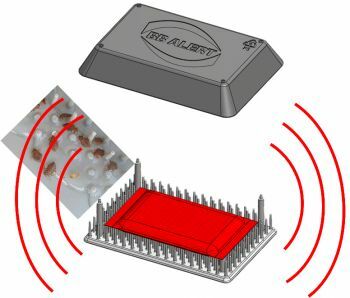 BB ALERT® Active is a Bed Bug detector and monitor. As its name suggests, it is designed to be actively attractive to Bed Bugs. Bed Bugs feed exclusively on the blood of warm blooded animals (specifically, people) and they use a number of "clues" to help locate their meals. BB ALERT® Active simulates the warmth and respiration that Bed Bugs use as indicators to find their hosts. When in use, the insulated top cover leaves a specifically designed gap around the unit's base. This restricts the flow of air, creating a micro-climate within the device and a controlled flow of heat and moisture to the outside. This temperature and humidity gradient leads the Bed Bug to the trap.